VLIKE Digital Thermometer Hygrometer is a battery meter for measuring relative humidity and temperature reading, a must have tool for HVAC technicians charging air conditioning systems.The easy-to-use interface makes it for a wide range of temperature and humidity monitoring applications including wine cellar storage, cigar storage, greenhouses, home indoor air quality, nurseries, music rooms, libraries, basements and garages. It is also useful for verifying humidity and temperature for optimal painting and finishing conditions. 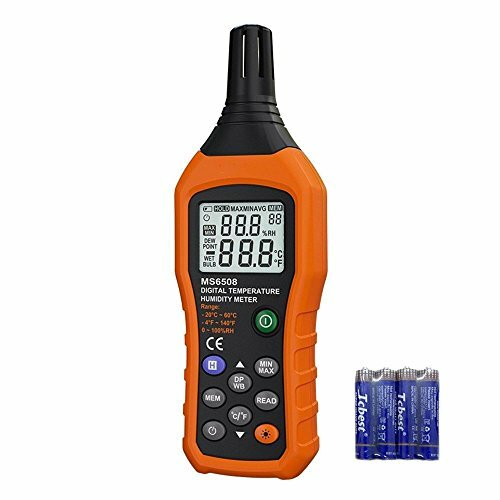 Use to check the plants' living condition, when planting flowers and trees/Keep track of bad moister on sound equipment which can harm electronics/Check the performance of heating and air conditioning equipment accurately by building engineer/Keep careful track of the humidity in wine cellar/Wonderful meter for ghost hunters or paranormal investigator. You can select humidity or temperature display at a LCD screen. You can also switch easily between Celsius and Fahrenheit when the screen show the temperature. If you have any questions about this product by VLIKE, contact us by completing and submitting the form below. If you are looking for a specif part number, please include it with your message.